Not many of us have the liberty of being able to ride a bike the whole year round, due to harsh winters. It is normally in the darkest days close to Christmas that we decide to sit down and watch films about bikes to remind us of those long forgotten summer days and motivate us to put in time on the home trainer. Cyclefilm is one company who provide beautiful, information packed films to do just that. 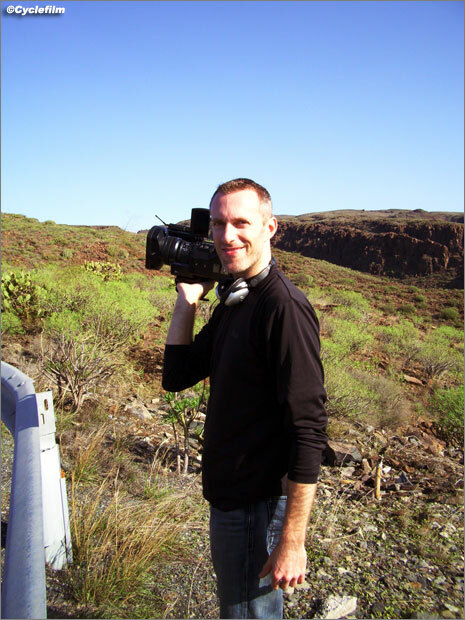 I caught up with Markus Neuert, Cyclefilm owner and director, one morning on Gran Canaria. Another day in the office for Markus, shooting in the Gran Canarian sun in December. PEZ: Markus, how did you end up starting Cyclefilm, and are you happy with how things have gone? I was working in Finance at Procter & Gamble for 6 years of which I spent 4 years in Geneva, Switzerland. Whilst living and working there I got into the whole outdoor lifestyle. From rock climbing to snowboarding to ski mountaineering, but it was mountain biking which struck a special nerve with me. The more time I spent on the bike the more I wanted to live an outdoor life. For even more inspiration I attended a bunch of mountain and sports related film festivals and even signed up to an adventure film school weekend. After that, I just couldn’t see myself in an office anymore. 12 months later I handed in my resignation and spent the summer cycling and putting together my big idea. Another 6 months later and CYCLEFILM was born. My aim was to fill the gap in road cycling related film content, from event coverage to reconnaissance to documentaries. I’m humbled by how many people have supported my passion over the years by buying DVDs or helping to keep my travel cost down by offering a place to stay or simply being there when I needed someone to talk to and bounce ideas off. You guys know who you are and you rock. So, yes, I couldn’t be happier. Markus behind the lens getting the right angle for some beautiful mountain riding. PEZ: What motivates you to film and make your DVD’s the way that you do? Being creative and able to put my vision and ideas into reality is very satisfying. Each new project has its own challenges and I enjoy solving problems that naturally crop up along the way. I’m also motivated to make every production better than the last one. The only problem is that as soon as I finish a project, I don’t like what I’ve done anymore. I always think I could have done better, but I just have to move on and take what I’ve learned with me into the next production. The most important thing however is that each production has solid content which is both informative and entertaining. 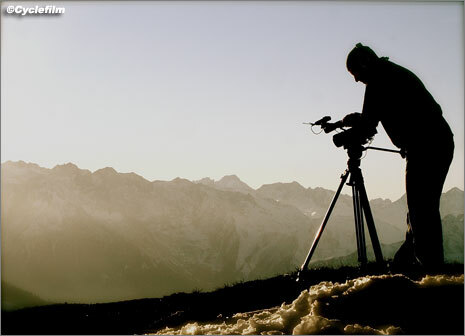 Film techniques, angles, lighting or the latest HD camera gadgets are secondary to content, story and message. 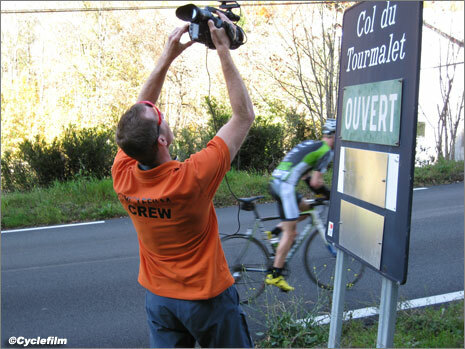 The Etape de Tour recon and Cyclepassion DVD’s are two recently finished products of yours, tell us a little more about them and some memorable moments from the filming. The Etape Recon DVDs are slowly turning into a legacy. The 2011 edition ‘Two Roads to Glory’ is the fifth DVD in the series. 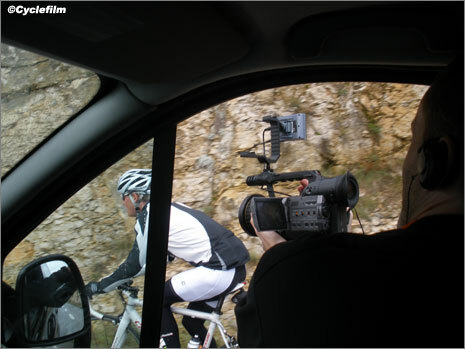 I remember back in 2006 when I first met Mike Cotty from Cannondale to film ‘The Road to Loudenville’ - Etape 2007 Recon. I ended up having to drive and film at the same time because the original driver I hired didn’t make the flight to France. He jokingly said he had a bomb in his carry-on luggage, which got him escorted off the airport. I still managed to finish the DVD, although I’d like to apologise to everyone watching for the wobbly video. Regarding the Cyclepassion Calendar documentary project, I hardly have to mention that, as a single male, this project was pretty much a dream come true. I’m very grateful to Anke (Cyclepassion Founder) for trusting me with the task and giving me 100% creative freedom. I think the resulting behind-the-scenes documentary ‘Eyes Wide Open’ is my best work to date. I’ve already started pre-production on the 2012 documentary, which will raise the bar even further on all levels. Just you wait. Markus documents the CyclePassion calendar shoot, a hard job! PEZ: Have you seen any cycling films recently which really motivate and amaze you? I’m always amazed at the production quality of MTB/Freeride films. They’re on par to big Hollywood productions. The last film of this calibre I’ve seen was LIFE CYCLES, a look at the life of a mountain bike from creation to recycling. A great movie with some of the most beautiful cinematography I have ever seen. Beyond the production though, I’m interested in story and content, something people don’t get to see during race coverage on TV. I think the cycling industry – especially Road Cycling - needs to work a lot harder to bring out the true characters of the sport and the film/documentary medium is a perfect vehicle for this. Finding decent funding for projects however is almost impossible; otherwise I’d have done a lot more work on this subject. PEZ: In a perfect world what would be your dream cycling film to make? I would prefer to work on a series of shows rather than a single film, maybe something along the lines of a Top Gear style programme - cycling entertainment with a twist. The show would give people a completely different spin on bikes and cycling and would help to bring out the characters as I mentioned earlier. A concept like this would allow me to satisfy my constant stream of ideas which are otherwise difficult to realise. It is not all oiled female cyclists at the Cyclepassion calendar shoot, Markus even had to get his hands dirty cleaning a bike. PEZ: You are currently here in Gran Canaria for a vacation; do you still like to ride after spending all that time filming and editing it? I love to ride, but it’s a lot more than just keeping fit. It was part of what made me want to become an entrepreneur – to be able to ride more and do business on the bike. You’d be amazed at how much business you can get done while riding with other people within the industry. The social bonding and networking value is immense. If I didn’t ride a bike, I don’t think Cyclefilm would be where it is today. Apart from that, cycling and exercise in general for me is the best way to de-stress and recharge my batteries. Another day in the office for Markus and his Etape De Tour recon star Mike Cotty. PEZ: Any sneak inside views on what we can expect from Cyclefilm in 2011? To quote the always entertaining Mike Cotty “chasing the Yankee dollar!” No, seriously, after 5 years in the business and with the help of emerging social media tools like Twitter and Facebook, Cyclefilm has become a trusted brand with a loyal following. I feel like I owe it to my supporters to branch out beyond just selling DVDs. Filmmaking will always be the core business, but I also want to share the knowledge and experience I gained building Cyclefilm from the ground up. This could be in form of business consulting work, cycle training camps or even filmmaking seminars. I’ve met so many talented and passionate people over the years who I can see myself partner with to take the Cyclefilm experience to another level. Fans show their love for all things Markus and Cyclefilm! Thanks to Markus for taking the time out to chat with us, we leave him about to head to the States for the winter. Keep an eye out for his work at CYCLEFILM because this biking entrepreneur is making some truly amazing DVDs.